(CNN) -- Life goes on for people who jump out of airplanes, even a day after two fellow parachutists died when their canopies apparently became entangled. Jumps continue at the Parachute Center, where two parachutists died Sunday. On Monday, the Parachute Center near Lodi, California, was open, just like it is any other day. The two jumpers who died Sunday had taken off from the parachute facility in central California. "Everybody's sad. Everybody's unhappy," said Parachute Center owner Bill Dause. "But everybody here is here because they enjoy jumping. Neither one of them would have wanted us to shut the doors," he said, referring to the jumpers who died Sunday. The San Joaquin County Sheriff's Office received a 911 call for assistance at 12:53 p.m. Sunday, said Deputy Les Garcia. The sheriff's spokesman confirmed there were two deaths, but referred questions to the Federal Aviation Administration. "We're investigating," said FAA spokesman Ian Gregor, adding that two investigators were on their way to the jump center. The inquiry could take months, Gregor said. "One of the main things we want to do is get a hold of a video that was supposedly taken," Gregor said. The FAA has purview over such issues as how the parachutes were packed -- by whom, when and how -- and whether weather conditions were correctly considered. "Obviously, in a situation like this, we certainly want to look at how the parachutes were packed," he said. "But it's possible that what happened is beyond our regulatory capability." Garcia said he could not identify the two victims. "The ID and notification of next of kin is pending," he said, because "one of the victims has two names." Parachute Center owner Dause and media reports have identified the victims as Robby Bigley and Barbara Cuddy. They were among eight parachutists from a competition team who jumped from an airplane at 9,000 feet to practice making a "canopy-relative formation," a maneuver in which they stacked parachutes near each other to form a wedge, Dause said. "The last two individuals docking experienced canopy problems," Dause said. 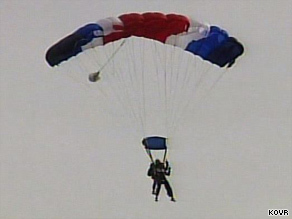 One jumper's chute rotated into another jumper's canopy and they smacked into a third parachutist, Dause said. The third parachutist managed to wriggle free, Dause said, but the other two remained entangled and spiraled down from 5,000 feet. They were unable to deploy their reserve chutes. They landed in a vineyard, Dause said. One victim was dead at the scene and the other died at a local hospital, reports said. Bigley and Cuddy are listed on the United States Parachute Association Web site as national record holders for formation jumps. Bigley's record jump occurred this year and Cuddy's in 2007. The jump team was preparing for a national competition in October. According to the United States Parachute Association, there were 30 skydiving fatalities last year. No figures were available for this year. The most fatalities occurred in 1998, when 44 people died. The fewest in recent years was in 2007, with 18, according to the association. Dause said there have been previous fatalities at the Parachute Center, but he did not elaborate. "We've been open for a long time," he said.